As the digital age moves quickly forward, marketers must adapt their own approach to include data-driven decision making. 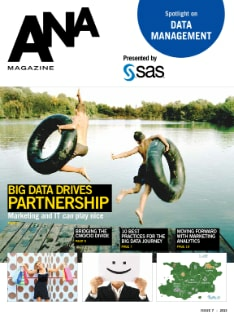 This thought leadership piece by ANA Magazine contains three excellent articles focused on data management and explores how marketing analytics helps reveal the true value of big data. Read more about how to bridge the CMO/CIO divide, the 10 best practices for marketers' big data journey and using advanced marketing analytics to deliver measurable value.